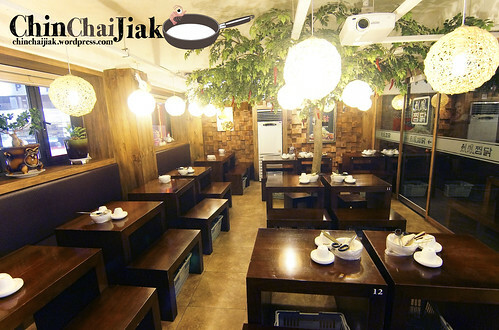 Yeolbong Jjimdak (열봉찜닭) is a restaurant opened by Korean Celebrity Se7en. I do not exactly know who is Seven, I can’t recognise him even if I see him on the street, and yes, I visited this place not for the celebrity but for their signature dish – Andong Chicken. 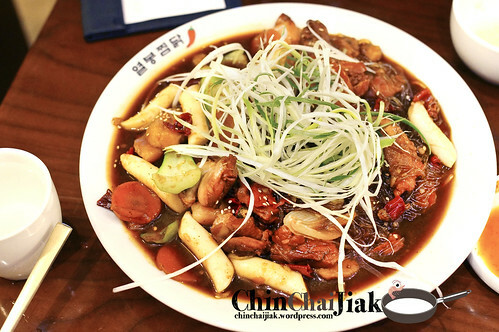 Andong Jjimdak (안동찜닭) literally means Braised Chicken of Andong. Obviously, chicken is the main ingredient, with various vegetables like carrot, potato, onion, ginger and green chilli, marinated in Ganjang (Korean fermented soy bean-based sauce) . The pot is then boiled over high heat till the potato and carrot slices softened and the dish is completed by adding shredded scallions and sesame seed. Yeolbong Jjimdak has a few outlets in Seoul and I visited their Hongdae (홍대) branch that is situated at the second level. There some basic English description on the menu. 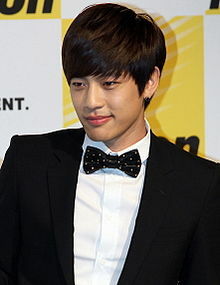 There are two kinds of Jjimdak, one is the traditional and second is the apparent Se7en’ version. Any Korean friends to help out and clarify? There are a few options to choose from, for example, the spicy level (from 0 to 3) and whether you want boneless (mainly breast meat) or normal chicken. Just a note of warning. I am a self-proclaimed chilli eater who can take really spicy food but decided to only order the spicy level 1 but that is already spicy enough for me! It’s not the unbearable kind of spicy but I was perspiring and I think ordering spicy level 2 is only for the adventurous. LOL. A small Andong Chicken cost me W$23000 which is not exactly cheap (food in Seoul’s restaurant is not exactly cheap though) and can serve up to 4 pax depending on what other side dishes were ordered. 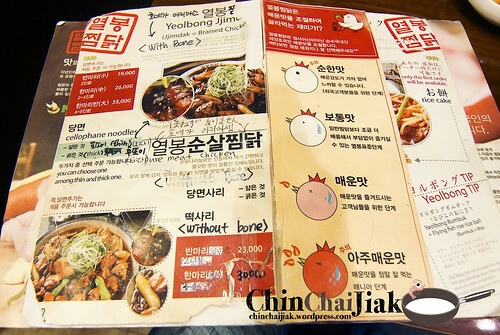 If not, it’s good for 2 pax just for the Andong Chicken itself. 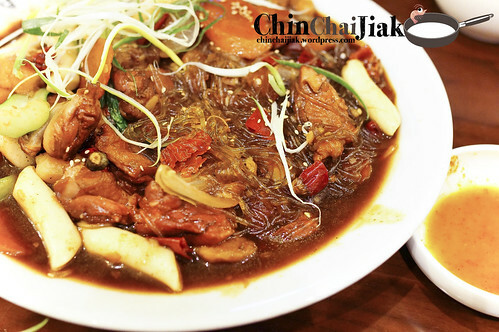 The gravy of Yeolbong Jjimdak’s Andong Chicken taste a little similar to our Chinese’s home-cooked Soy Sauce Pork but packs a lot of punch with the added chilli. Shiok! Personally, I like this dish a lot and I went back a second time. The chicken is very tender even for the breast meat. 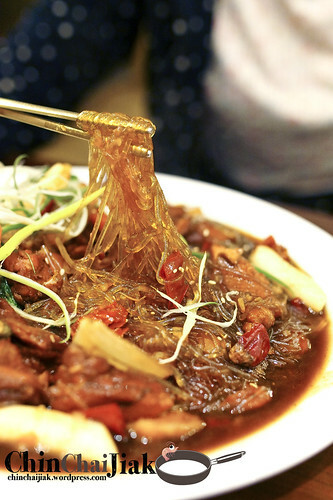 I also love the starch noodle that is soaked in the thick and flavourful gravy. This starch Noodle is definitely a delight and it is good enough for me so I did not order any additional rice. Remember to cut the noodle using their scissors. It’s a must. Their potato and carrot slices are also rather well- cooked as it’s not overly soft that it still retains it’s natural sweetness. I can’t find fault with this Yeolbong Jjimdak’s Andong Chicken as it is really well done in all aspect, be it the chicken, Potato, noodle or the not overly-sweet sauce. I am a little curious how the original flavor taste without the spiciness so I went back on the next day. I thought I will enjoy the non-spicy version more cus I can eat it with ease with no perspiration but I was wrong. If you are coming to Yeolbong Jjimdak, I recommend to order level 1 spiciness. The spiciness is one of the reasons that made this dish so enjoyable and unique. I mentioned earlier that Andong Chicken taste a little like our Chinese’s soy sauce braised Pork but much more spicy and less oily. Among the almost 30 kinds of food I had in Seoul, I thought Andong Chicken really suit my taste and I list it among the my top 10. Who cares whether is it opened by a celebrity or not, I still think Yeolbong Jjimdak is quite a decent place to have a hearty meal! It’s already near closing time when i reached here. The funny part is, i still thought that i am rather early without realising that i did not switch my time to Seoul’s time. 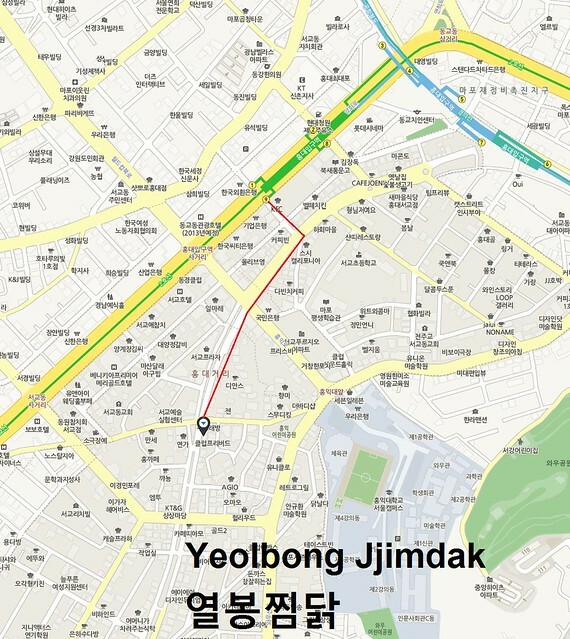 Note that Yeolbong Jjimdak is situated at Level 2. This place is rather easy to find if you follow the direction as shown in my map. 1. 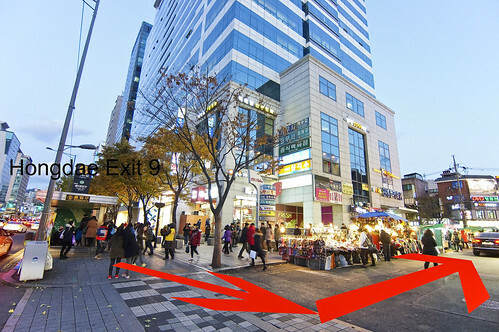 To go to the “happening” part of Hongdae, always remember Exit 9. When you come out from Exit 9, turn left and walk straight and you will come to a T-Junction. 2. 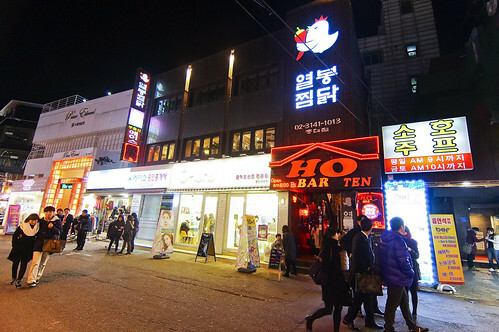 At this T-Junction, turn left to the quieter area of Hongdae and turn right to the busy part of Hongdae. To go to Yeolbong Jjimdak, turn right at this T-Junction. 4. Take note that you need to cross two cross junctions. The first one has a rather busy traffic and sometimes i need to cross with the traffic light. Click to enlarge – Exit 9, turn left and walk straight to a T-junction. 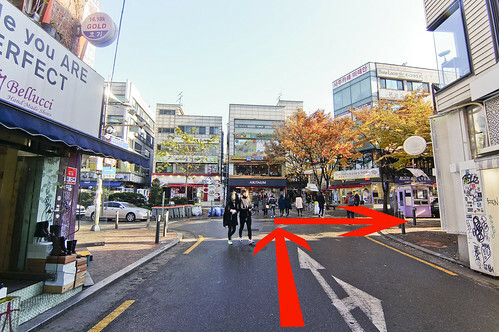 Turn right and walk straight as shown and you will be able to see Yeolbong Jjimdak on your left. Note that it’s on Level 2. 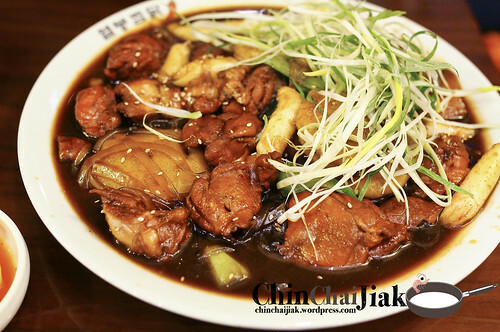 Posted in Dishes - Andong Chicken, Good For - Casual Dining, Location - Hongdae, Type - Celebrity Restaurant, Type - Traditional Korean Food.